This display pack features 24 one ounce containers of our lube and showcases them for resale. A must for and serious engine builder or speed shop! 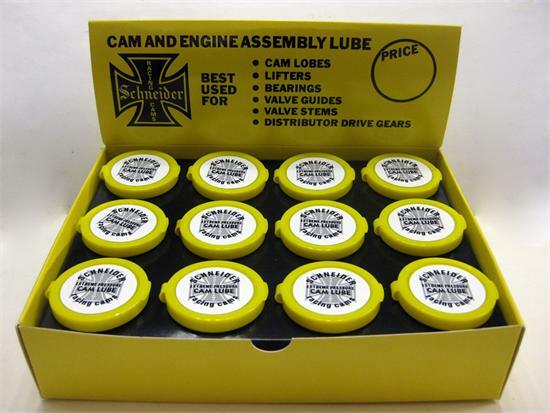 This product is Schneider Racing Cams' proprietary blend Cam Lube that is second to none. With high levels of zinc and phosphorus to act as a buffer between the cam and lifters you can be at ease that your new cam will be protected during break-in. We offer our cam lube in a variety of sizes so no matter what cam you have, we've got it covered. DONT DRY START AN ENGINE!